I just came back from Banawe, the mecca of auto parts in Quezon City. I had to find a cheap mud guard since our terriers chewed up our front mudguards. Getting an inexpensive car accessory in Banawe is not a problem. What you should worry about is the safety of your own car as there are lots of "tambays" who offer car services and some double as car accessories stealers. I've heard of some horror stories from Banawe. If the auto supply store doesn't have what you're looking for, they'll look for a car parked nearby and steal it for you to buy. Of course you never know if what you're buying there is hot or not. One other thing I frown upon when in Banawe is that those street people who look for customers will stop and look at your car in detail and will critique almost everything so they can offer their services. For my car, I was told that I needed new suspension, headlight guard, another mudguard, rain protector, new tint, door protector and a paint job. If my car had any emotion, it must've gone into depression. I kept on telling the people that the car is fine and I don't need any additional accessories. Imagine, I was even offered a remote control for the car. Remote control ? For what ?!?!? While the mudguard was being installed, there were at least 5 other people (usiseros) who had nothing to do with the installation. They just watched and eavesdropped on my conversation with the mechanic, possibly hinting for anything else they could offer me. I couldn't understand why they stay there. It isn't a damn freakshow. They made me more uncomfortable because I was thinking someone might distract me while somebody else may be stealing something from the car. I remember my side view mirror was stolen the last time I passed by this place in the past. Anyway, I saved 80% of the regular price if I would buy it in an authorized Toyota dealer. I'm just glad I got out of there without any casualty. bro, thanks for your post! am looking for car accessories for a 04 Ford Escape XLS, as these would be very expensive if bought from Ford directly, do you think Banawe has these (fog lights, rain protectors, in-dash DVD's etc., alarm remote)? Can you recommend me a shop to shop? maraming stores dyan catering to all brands and models. meron mga foglights, rain protectors, dvd consoles, tint, mags and other accessories there. you just have to scout them out and canvass. 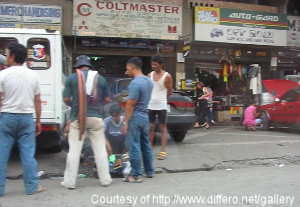 it's one stretch of stores there from left to right starting from the corner of E Rodriguez and Banawe. May mga lalapit pa sayo while you're in your car and ask what are you looking for. They could help you out. (Competitive kasi dyan dahil tabi-tabi sila).